Unintended Playthings: Dollhouses Over Time | Skinner Inc.
Dollhouses are among the most collected toys by both adults and children, as seen by their induction into the Strong National Museum of Play in 2011. With doll and dollhouse collecting communities throughout the world, as well as specialized dealers and auction houses, it’s no surprise that the best specimens of these playthings are still so sought after. On October 14th, the Concord Museum opens its much anticipated exhibition titled The Art & Mystery of the Dollhouse, featuring many of the finest examples in both public and private collections. Included are houses and furnishings spanning the 17th-20th centuries, miniature furniture crafted by curator David Wood to emulate pieces in the Concord Museum’s permanent collection, and four “room dollhouses,” loaned by the Strong. Of notable interest is the miniature silver displayed in the William & Mary House, c. 1700. Although an early instance, the history of dollhouses can be traced back further. The dollhouse, or baby house as they were called, finds its origins in 16th century Europe as more cabinets of curiosity for the wealthy. These cabinets housed miniature furniture, accessories, architectural details, and figurines to represent idealized interiors. In many instances, these furnishings exhibited amazing craftsmanship and were constructed of exotic materials. Due to the time- and resource-intensive nature of building and decorating these early baby houses, they stayed primarily an adult interest. The advent of the Industrial Revolution in the 18th and 19th centuries afforded German, English, and American toymakers access to means of mass production. 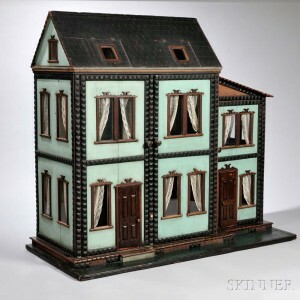 This allowed dollhouses to be produced in larger quantities, for significantly less than their earlier counterparts, and marketed towards the growing middle class. Not only did their price change, but so did their purpose. While initially a show of wealth for adults, dollhouses transitioned to child’s playthings as a form of roleplaying that embraced the world of imagination, and provided children the idea of household management and decoration. Through the 19th and 20th century, manufacturers and types of dollhouses and furnishings expanded. In the late 19th century, F.A.O. 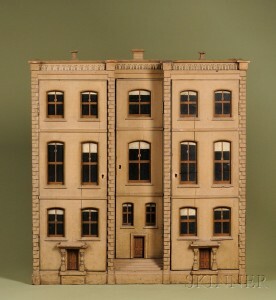 Schwarz began advertising and selling four, six, and eight room dollhouses in varying levels of ornateness. 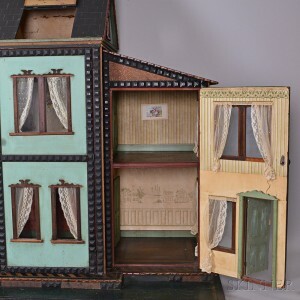 These dollhouses were later called “mystery” dollhouses, a phrase coined by Flora Gill Jacobs, Founder of the Washington Dolls’ House and Toy Museum, because the origin and maker remain unknown. Skinner’s October 13 Discovery-Asian Art, Dolls & Toys auction features one of these top-of-the-line, rare, and collectible models of “mystery” dollhouses. Lot 19 is a six-room example with a robin’s egg blue exterior with scroll-carved accents and paneled doors, fully wallpapered interiors with painted parquet floors, and two dormer windows revealing an attic. Honest dollhouses of this caliber rarely come up for sale and Skinner is pleased to be offering it. Preview this and other antique dolls, dollhouses and toys at Skinner’s Marlborough Gallery on October 11 from 12PM-5PM and October 12 from 10AM-7PM. This entry was posted in Blog by Kyle Johnson. Bookmark the permalink. Hi Laura, Thanks for the comment. Our Specialists and Appraisers would be more than happy to help you – To find out what your doll house(s) may be worth at auction, please submit photos and an auction evaluation form on our website: secure.skinnerinc.com/appraisals/form.asp. Your information will be forwarded to the appropriate Department. Thanks for the cool read about dollhouses. I didn’t know that they were originally suppose to show wealth for adults. I’m kind of interested to learn if there were visual differences between the ones you could play with and ones you had to have for decoration.